It’s a short but scenic boat ride from San Francisco to Alcatraz Island, site of a famous prison, now a national park. But Alcatraz is much more than its most notorious inmate – gangster, tax-evader Al Capone. In the 19th century a lighthouse and Civil War era fort were built on the island, families and children lived on Alcatraz for over 150 years – each era is different. 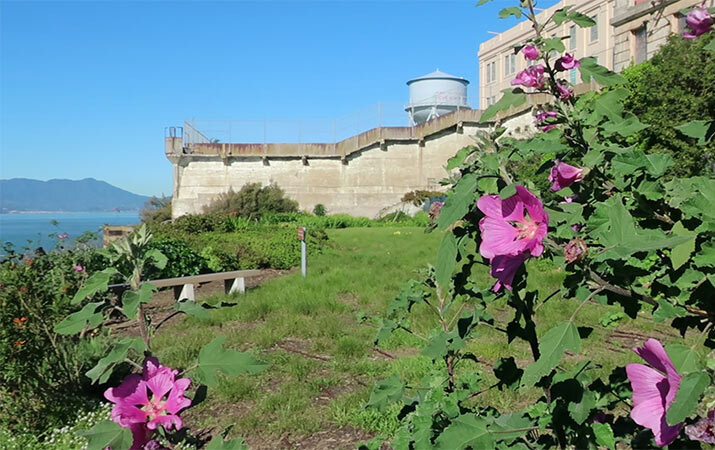 On Alcatraz today, shore birds make their nests, gardens grow in profusion, flowers bloom, the island has a panoramic view of San Francisco across the water. For centuries, Indian tribes such as the Ohlone and Miwok lived around San Francisco Bay, but probably didn’t stay on this rocky island, as there is no source of fresh water. When the Spanish arrived in late 18th century, they named the island “Isla de los Alcatraces,” which means Island of the Pelicans. 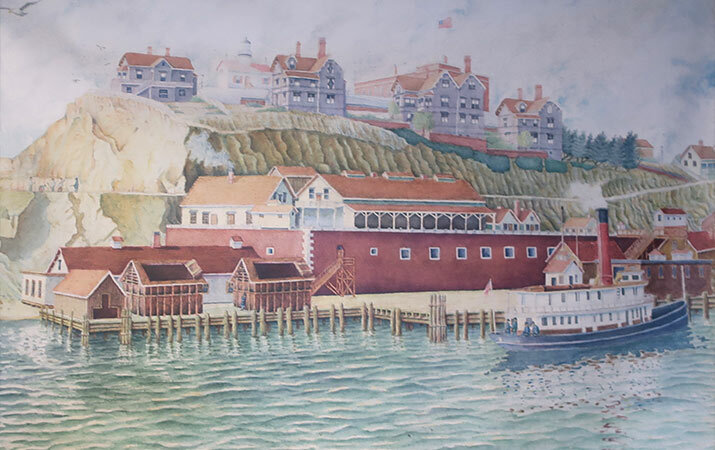 In the mid-19th century, the harbor was very crowded with ships, a lighthouse was built on the island. The lighthouse keeper had a family, and the children helped to light the lamp every night. The lighthouse is still in operation with modern lighting. In 1859, US army erected a fort to protect the bay, officers with their families came to live on the island. Alcatraz was a great spot for the children to fly their kites. The island was ringed with cannons and defended by 400 soldiers on Alcatraz, though it was never attacked. Alcatraz was also used as a military prison throughout the 19th century. During the Depression, the federal government turned Alcatraz into a maximum security prison for hardened criminals. From 1934 – 1963, Alcatraz was famous for inmates, such as Al Capone and “Machine Gun” Kelly, and fourteen escape attempts from the island. Families of correctional officers for the prison lived on Alcatraz, the kids took the boat to school in San Francisco during the week. It was a tight-knit community with bowling alley, cafe, post office, clinic, movie theater, room to play baseball and football, a Christmas Eve celebration that included Santa Claus. After the prison closed, from Nov 1969 – to June 1971, Native American tribes occupied Alcatraz, protesting two hundred years of injustice by the government. Along with adults, children lived on Alcatraz, and learned about tribal culture and arts, along with standard school curriculum. Alcatraz, a national park since 1972, is a unique San Francisco experience. Before boarding the boat to Alcatraz, check out the large model of Alcatraz to get an idea of what the prison looked like in the mid 20th century, and replica of 1860’s cannon. The boat ride to the island is stellar, and kids will enjoy seeing the San Francisco skyline from the water, and views of the Golden Gate Bridge. After getting off at the boat dock, stop to watch the excellent ten minute video about the history of Alcatraz in the theater next to the bookstore. It’s a quarter mile walk from the dock up the steep hill to the prison itself, the Cellhouse. Pick up the free audio tour (eleven languages, no kid’s version), go at your own pace, walking through the cell block, library, dining room, prison yard, administrative wing. Doors of selected cells are open, so kids can step inside. The audio tour, with sound effects and graphic, first-hand experiences from inmates and correction officers, narrates daily life for prisoners, and dramatic events such as the 1946 riot (guards were taken hostage) and 1962 escape. After completing tour of the Cellhouse, explore the island. The gardens on the west side are lovely, run around the Parade Ground, check out the lighthouse still in operation (but you can’t go inside). 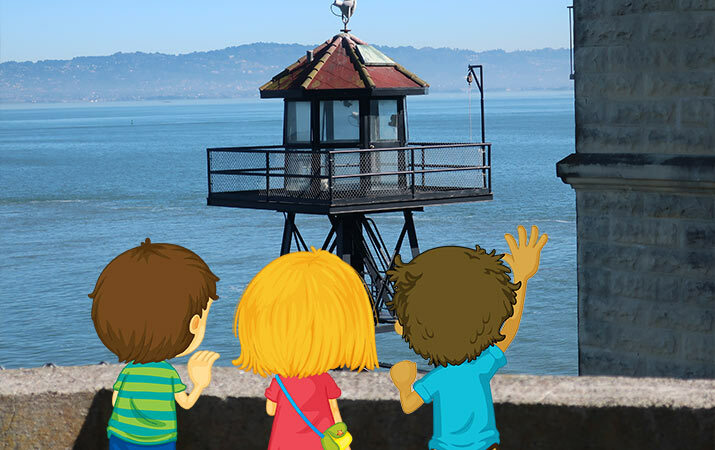 If you have toddlers and younger kids along, skip the Cellhouse – take them to the Parade Ground to watch the container ships and sailboats going by in the bay. Or walk around the east side of the island to the Model Industries Building. When to visit – Summer isn’t necessarily the best time to visit Alcatraz. Weather can be cold and foggy (bring jackets), and most crowded. In winter, there are fewer visitors, and days can be bright and clear (although rainy also). Alcatraz Cruises tickets – To get to Alcatraz Island, take the boat from Pier 33. In summer, purchase day and time departure boat tickets well in advance (cruises can get sold out). Check the return boat schedule – Boats run frequently to and from the island, about every half hour. Be sure to arrive at the dock at least ten minutes before departure, boat leaves on time. Food on the island – No food is available on Alcatraz, only bottled water. On Alcatraz Cruises, the snack bar has a small selection of sandwiches and cold drinks. Picnicking is allowed at the dock only, picnic tables and benches are available, plan to bring lunch and snacks for the family. Don’t feed the birds or animals – Like all national parks, wildlife on Alcatraz is protected, chips and nuts can make animals and birds sick. Walking and strollers – The Cellhouse is not a place for strollers – it’s a steep walk up the hill to the Cellhouse, and sections the audio tour involve going up and down stairs. An electric tram is available to take older people with physical limitations, but cannot accommodate families with strollers. Restrooms – Restrooms are at located at the dock, and also near Warden’s House next to the Cellhouse. Where is Alcatraz? by Nico Medina. 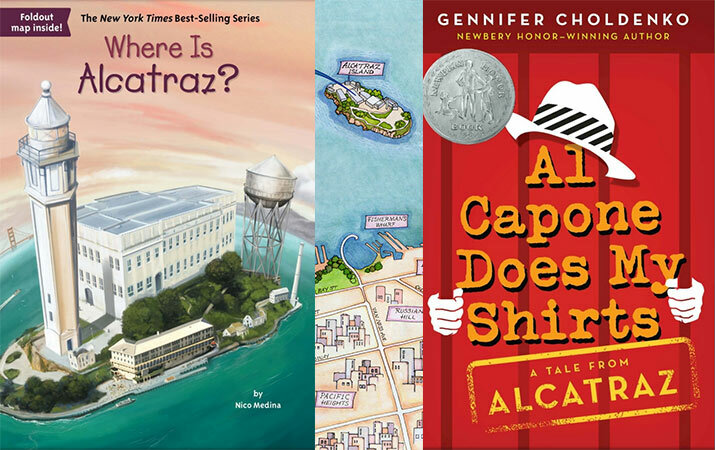 Tales from Alcatraz by Gennifer Choldenko. “Today I moved to a twelve acre rock covered with cement.” Moose Flanagan was an ordinary 7th grader until his dad takes a job on Alcatraz. The Alcatraz Escape by Jennifer Chambliss Bertman. Tip: Our Alcatraz video has blues banjo music. The inmates were only allowed to play stringed instruments, Al Capone played banjo in the Alcatraz band. Of course, visiting San Francisco, you’ll need a fun place to stay. On Travel for Kids, check out our list of selected San Francisco family hotels, and more fun things to do at Fisherman’s Wharf.